Here are my 2 paintings juried in to the MBPAPA/ Natividad Exhibit and Sale that runs from April 9th 2019 to early 2010. A portion of Sales benefit the Natividad Hospital of Monterey County. From the 19th to the 23rd of June, I will be joining fellow juried artists to paint in the areas around beautiful Los Gatos, California. We will paint from Wednesday to Saturday, then submit paintings for a preview sale on Saturday evening and an exhibition and sale of our works on Sunday. Please come by to watch, say hi and enjoy the final show. 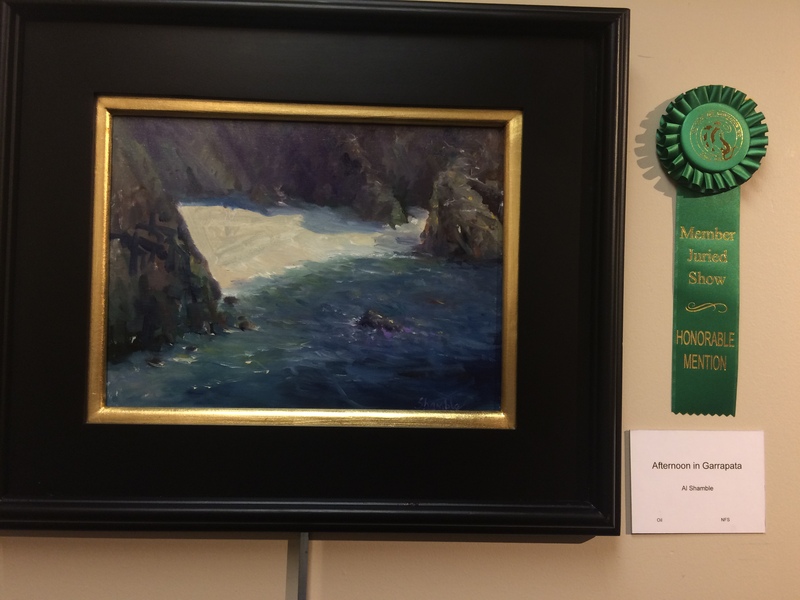 How exciting to be awarded an Honorable Mention by esteemed juror George Rivera at the LGAA Fall Show last Wednesday 11/14/18. A real treat to be recognized amongst a wonderful organization of talented artists and a show with so many wonderful works of art. 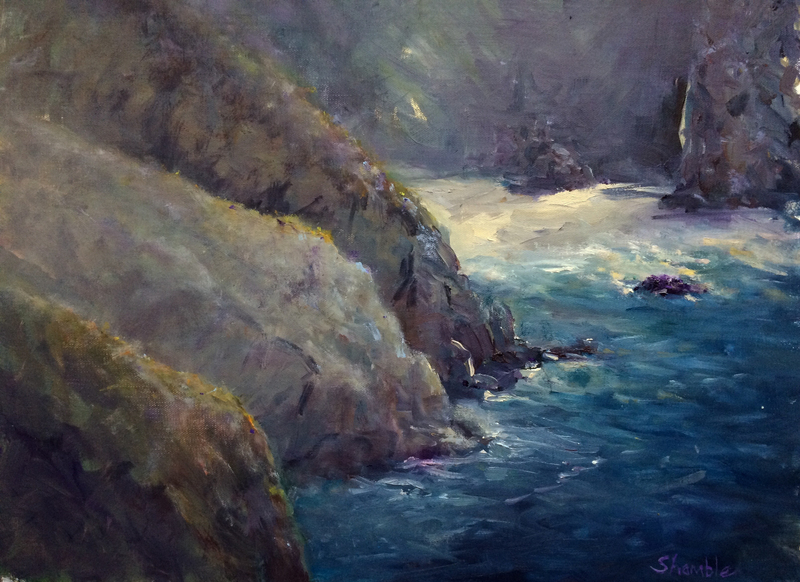 This was a Plein Air piece painted along the cliffs of Garrapata State Park near Big Sur. 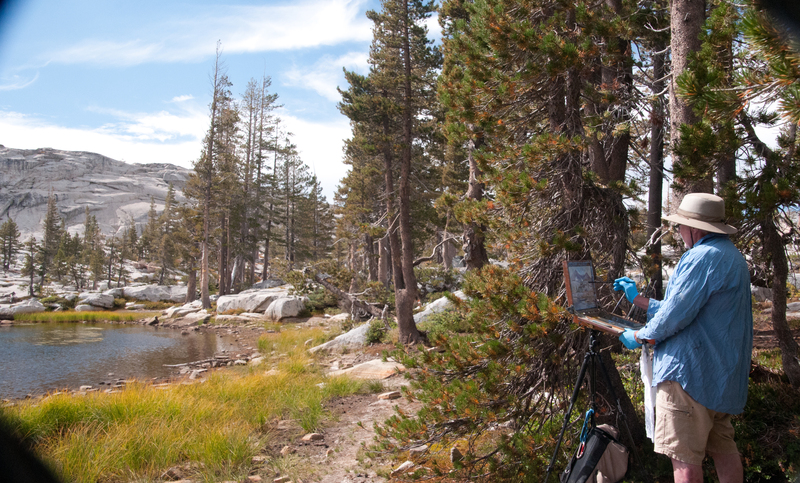 Sometimes while painting here, the wind is so bad you have to hold onto the canvas while painting. On this day it was calm and I was able to paint in the morning and again in the afternoon. What a great honor to be juried into Signature Artist status with the MBPAPA this past Saturday ! Thank You to to the selection committee of the Monterey Bay Plein Air Association for including me in such a wonderful group of artists. Here is one of the 6 paintings I submitted . 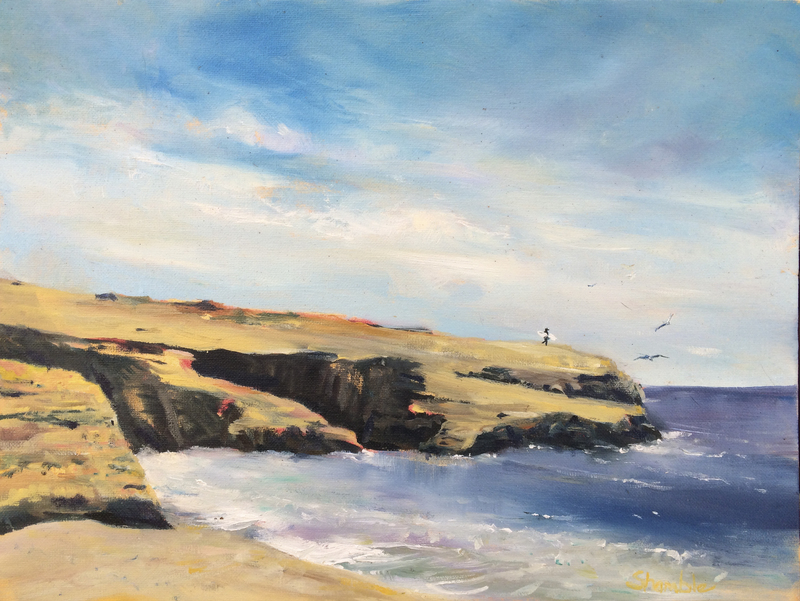 It was painted from the parking lot above Natural Bridges State Park in Santa Cruz. Somewhat emotional for me because once there were 2 Natural Bridges. As kids we used to run across the tops of these, but this one collapsed in the major Loma Prieta earthquake. 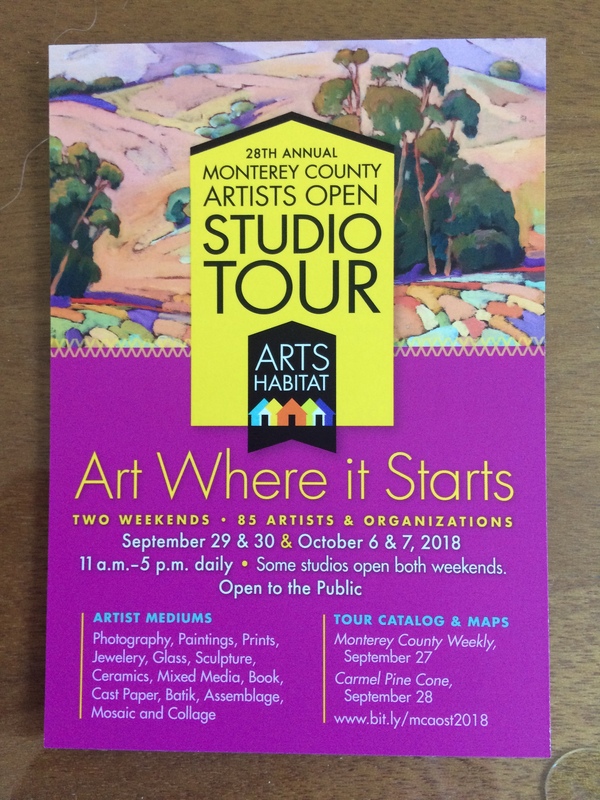 Excited that I am a participant in this years Monterey County Artists Open Studio Tour ! Please stop by if you are in the area, I will have paintings for viewing and sale at our home on both weekends. I have chosen some interesting pieces from several decades of painting in watercolor and Oils. And just to add to the excitement some mountain Photography including the famous and elusive “Horsetail Falls at Yosemite”. Here are a few new paintings from the last month. Echo Peak in the Sierras, and East Garrison Chapel in my new hometown. 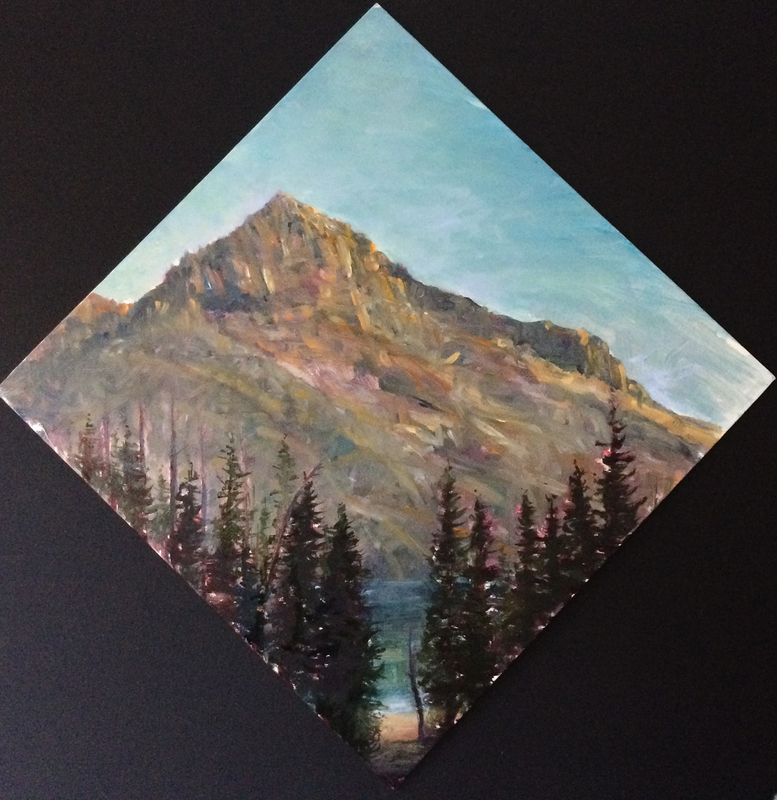 I heve 4 Plein Air paintings in 2 juried shows this month, near my new home in East Garrison. 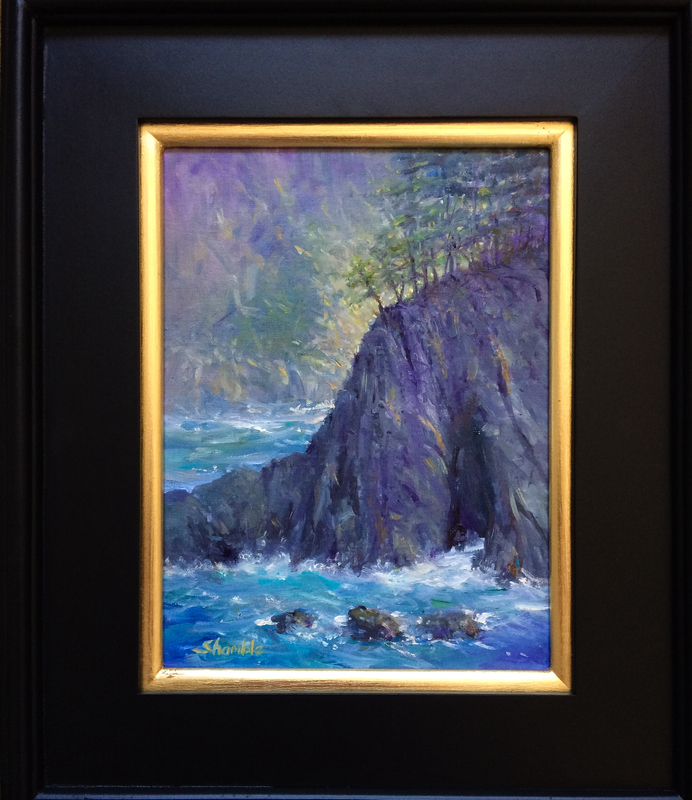 The Central Coast Plein Air Painters show ” A Toast to the Coast” will have 3 of my paintings for sale and display at the Wargin Winery in Watsonville from July 6 to Aug 30. 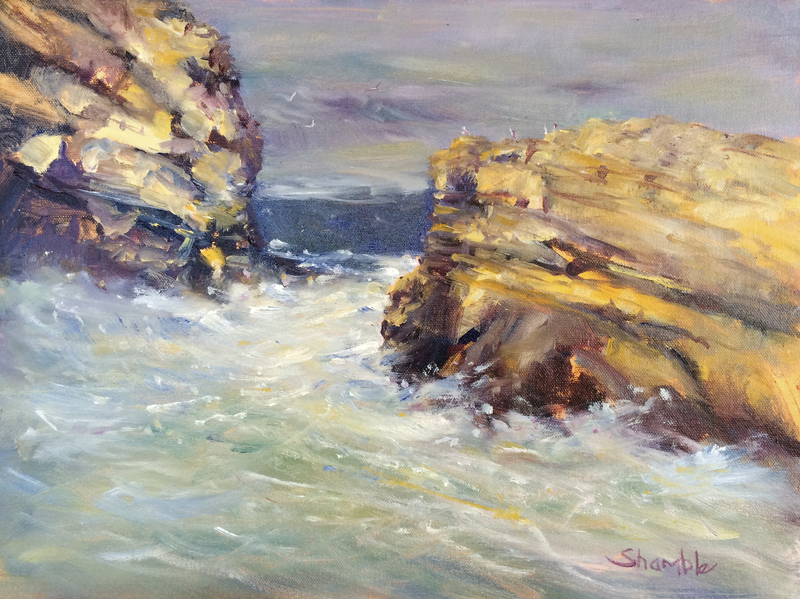 The Monterey Bay Plein Air Painters show ” California Dreaming” in Pacific Grove occurs during the same dates. And to make things interesting both shows are hosting a reception on the same day July 6 from 4-8 pm at Wargin, and from 7- 9 pm at Pacific Grove. Hopefully I can bounce from one to the other. Santa Fe is the home of one of the 3rd largest Art community in the US. When you visit be sure to go into the many museums and art galleries. There are 100 galleries alone of sculptures and paintings on the few blocks of Canyon Road. Georgia Okeefe Ghost Ranch,the Taos Art museum and Feschin’s paintings are an hour away but well worth the trip ! 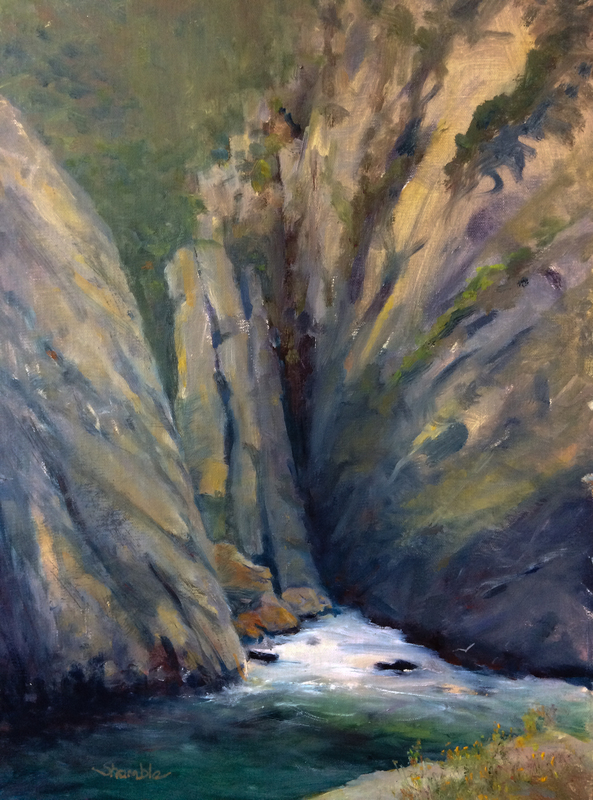 The fun challenge for me was to embrace new ways of seeing and pick up new ideas from the New Mexico area and from the workshops at the Convention. 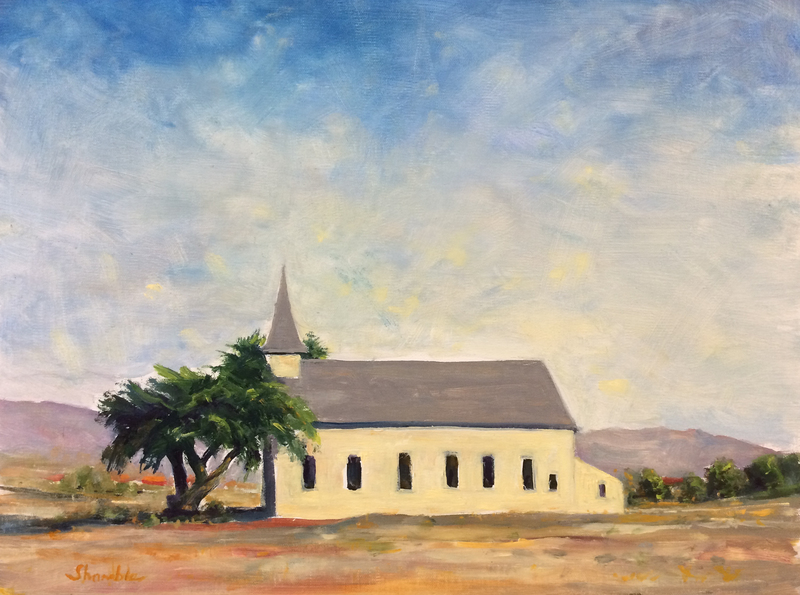 I did not post any of my New Mexico Plein Air paintings because they are experiments. Strong winds, even snow challenged us all. Trying new colors , new techniques often result in failure – but thats how we learn ! Master painter Kevin McPherson during his demo on stage stated: ” Challenge yourself – that’s a good reason to fail” and Bill Davidson “Go with your strengths but work on your areas for improvement + No Fears- Loose your Ego”. Bill Davidson : Paint the focal point and the area directly around it first ! Concentrate on this and the other areas take less time and aren’t as important. 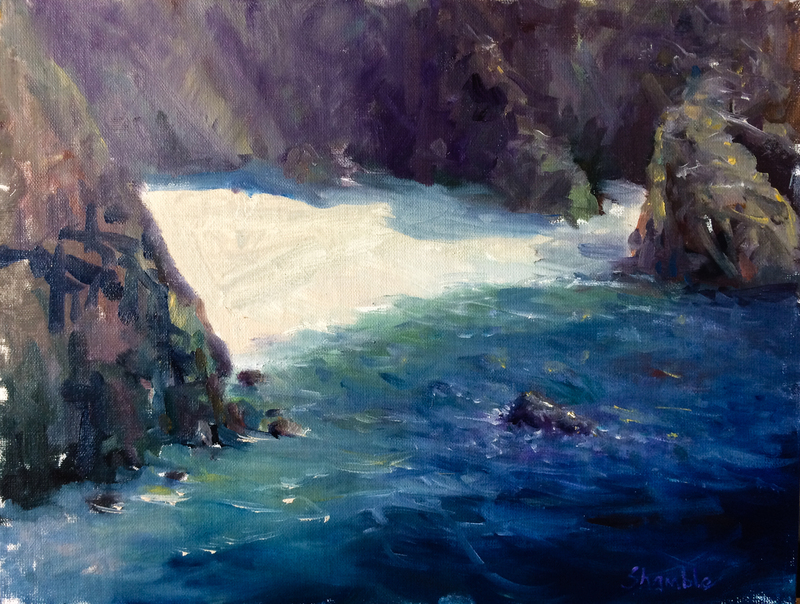 Thats what I did when I went to Pt Lobos and painted “Neptunes Beach” . The beach and water are the Focal point with strongest contrast, brightest colors , composition lines leading to it. Thomas J Kitts: Warms against Cool – color temperatures are important , lay each stroke like tiles and ask should this be warmer or cooler that what it is next to. For example a cool greenish blue, might need a warmer red/blue next to it, or might need to go evencooler with purple blue. TJK from Sorolla : ” Do not see the painting with preconceived notions, see the painting that is coming ” ! David Santillanes : Save bright Cadmium colors for the foreground. Blue always goes back into the distance. Kevin McPhesron – painted darkest dark first then shadow family of colors. Then cleaned palette and painted lights and highlights. Then reinforced some darks. I am looking forward to driving out to Santa Fe, New Mexico for the Plein Air Convention and Expo. This will be my 4th time attending, so I obviously enjoy getting together with over a thousand other Plein Air painters from around the world. The sharing of ideas, the numerous technical workshops, and presentations by acknowledged Master painters are all inspirational. We all gather for several afternoons to paint together and set world records. Should be fun trying new colors in the New Mexico atmosphere. I love standing along a cliff at the shore , looking and listening to the ebb and flow of the the waves. Better still is to be there painting ! Monday I painted at Pacific Grove, on a beautiful day along Monterey Bay. Three of my Plein Air painter friends joined me for a marvelous day at the coast. Our choice was Garrapata State Park , near Big Sur. We were blessed with sunshine, painterly light, and no wind ! Here are two of my paintings from the day and a few photos of the scene.